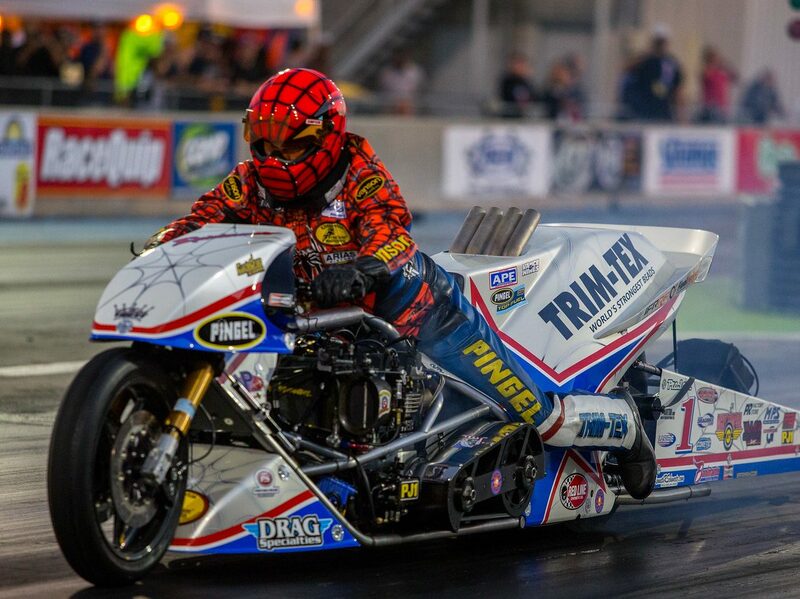 Multi-time Top Fuel Motorcycle champion Larry “Spiderman” began his 2018 campaign with a runner-up performance at a chilly and rain-plagued ManCup Exoticycle Spring Cup from South Georgia Motorsports Park, April 6-8. The weekend’s bright spots for the 18-time champion came on Friday when McBride recorded a 5.76 at 251 mph during a test run, and took the pole positon with a 5.84 at 244 mph in opening qualifying. Every other run resulted in smoking the tire just after the hit of the throttle. It’s something that has the veteran team baffled. “We’ve got clutch issues and we are not exactly sure why,” McBride said. 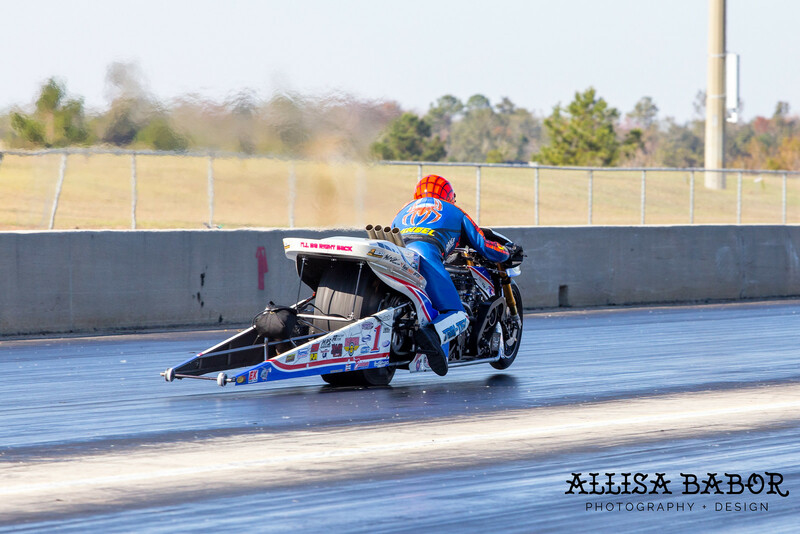 McBride smoked the tire during his first test pass of the year, after he unloaded the bike on Thursday. The team made some changes and believed the problem was fixed after Friday’s strong performances. The team was unable to make a run on Saturday as the scheduled qualifying was canceled due to rain. Sunday brought frustration for the world-record-holding team, who ran 5.61 and 258 mph at the same track just five months prior. In the morning McBride smoked the tire during his final qualifying attempt, and smoked the tire again during his opening round bye run. For the final the team made wholesale changes to the clutch to try to correct the problem. The result was the same as McBride again smoked the tire about a half second into the run. McBride and his team noticed how difficult the bike was to push back and push to the line in the final. McBride does not think the problem is related to his new carbon-carbon brake setup. “We checked everything between rounds. Something is going on that is not showing up in the pits or on the computer. We don’t think it was the track either. The only thing to do now is to take it back to the shop and take everything apart to figure it out,” McBride said. McBride and his team extended a big congratulations to Dave Vantine, who took the event victory with a 6.74. “I’m very happy for him and his team,” McBride said. 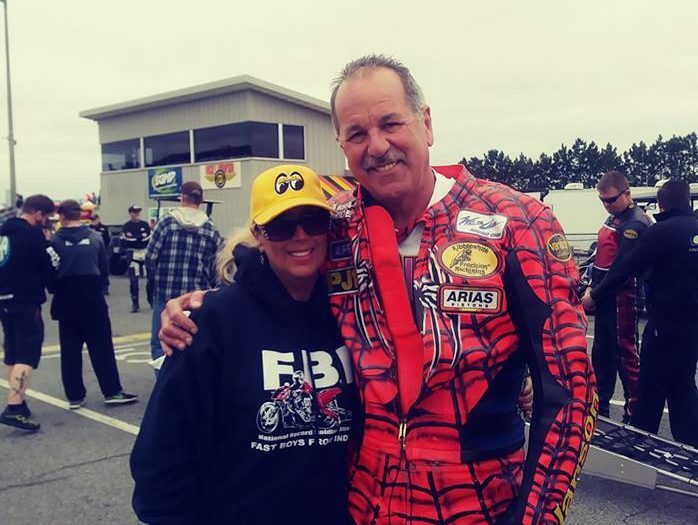 Larry McBride and Lana Allen of Team FBI. McBride and his brother will now make the long drive back to their Newport News, Va. headquarters where they plan to overhaul the machine in preparation of the next race in Rockingham, N.C. June 1-3.